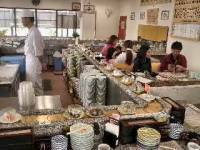 One well-known image of Japan, combining traditional culture with modern technology, is that of the conveyor belt sushi restaurant. These places are however very rare in Okinawa. Gourmet Kaiten Sushi is one such rarity. A large bright, airy place - most of the center of the room is taken up by the belt moving dozens of delicacies round a huge rectangular counter. Patrons sit at the counter and select which sushi they want. There are also some separate tables to sit at. Aside from the serving arrangements, Gourmet Kaiten Sushi is unconventional in another way. It does not produce only seafood creations, as a normal sushi outlet does. It uses all sorts of other ingredients, including chicken, hamburger, beef and eggplant. The other main difference between this place and an ordinary sushi bar is that it is a lot cheaper, almost half the price you would expect to pay elsewhere. You can of course also see exactly what you’re getting before you select it. The conveyor belt system is based on five different colors of plates. They are priced differently, according to what you choose. Then when it is time to pay the bill the empty plates are tallied at the end of your meal. To remind you of the price of each plate a set of them are fixed to the wall. Blue is ¥90, yellow ¥120, white ¥160, pink ¥250, green ¥350 and brown ¥550. For ¥90 you get half a dozen sushi rolls(rice wrapped in seaweed) with various types of filling such as pickled radish, plum paste and cucumber. Another dish is fried bean curd stuffed with rice. The ¥120 menu is more extensive, consisting mostly of pairs of sushi made from ingredients like octopus head, clam salad, plum and jellyfish, squid and fish egg, chicken salad and pork cutlet. There are also more elaborate sushi rolls than on the cheaper dishes. The mid priced ¥160 plates offer the most choice. They include hamburger sushi, teriyaki chicken, salami ham, eggplant, spinach, herring egg with squid and tuna with fermented soybean. The ¥250 selections are mostly classic sushi, raw seafood slivers draped over rice. They include crab, bream, salmon loin, shrimp tuna and salmon roe. There is also some meat sushi like smoked beef and pork cutlet. For ¥350 you get a small but exotic selection, including freshwater eel teriyaki, abalone, sea bream and sea urchin. There is just one ¥550 sushi, top grade tuna loin. DG tried several dishes, including some that are not put on the conveyor belt because they would not keep, even for a few minutes. In this category was yakiniku with pork, raw egg and spring onion. He also sampled several varied sushi dishes: squid, fried shrimp, raw beef. They were all fresh, expertly made and of comparable quality to restaurants that charge twice the price. Other fare not on the belt, which has to be ordered separately, includes four varieties of soup: bean curd, seaweed, shellfish and crab. They are in the first four price categories. DG tried the shellfish, which was excellent. There is also a fried food menu which includes chicken, squid, oysters and french fries. Each dish is ¥160. The broiled section offers tuna, salmon and horse meat for ¥250 and ¥550. Desserts include cake, cheesecake and red potato torte. There is Orion beer and soft drinks. Gourmet Kaiten Sushi does take away orders and will make sushi without wasabi, if requested. They accept dollars. Directions: From Gate 2 go over the Goya Intersection with Route 330 and continue for about 5 km. Take a right onto Route 329 and turn left at the McDonald’s on the corner. Just before the Daiei Hypermarket on the right is Gourmet Kaiten Sushi.